The pros and cons of different braces. Some people are very lucky to have their adult teeth grow in perfectly straight, but if you are in need of braces for yourself or your child, your orthodontist can recommend any of the following types of braces to straighten your smile. The most inexpensive type of braces are the traditional, stainless steel versions. Obviously, the drawback to wearing these is how visible they are, but most patients will find a quicker solution to a great smile with an average wear of only two years. Metal braces hold a thin wire in place with rubber bands to put pressure on the teeth to move them to the desired place. A bit more expensive than traditional braces, ceramic braces work the same way as their metal counterparts, but these brackets are made from a clear, transparent ceramic material. 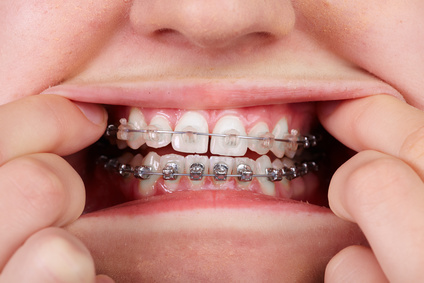 Although the braces seem less visible than the metal ones, patients have reported that the elastics seem to discolor depending on the foods they eat. Tomato sauce, coffee, orange juice, and anything acidic will usually stain the bands. Ceramic braces are popular with adults who need orthodontic treatment, however they’ll also take a few months longer than the metal braces to move your teeth. More expensive than metal or ceramic braces are lingual braces. Instead of cementing brackets to the outside of the tooth, they are cemented to the inside, next to the tongue, to remain out of sight. Not all orthodontists install these types of braces, and the patient will need to have large teeth to fit the brackets. Installing and tightening them are a far more complicated service, and will require more time during your visits. Lingual braces also take longer to get used to; speech impediments are common for the first few weeks and sometimes for the entire duration of the treatment. Sores on the tongue are also common patient complaints. Invisible braces like Invisalign are the most expensive of all your braces options, and only those with minor alignment issues will be able to wear them. Instead of brackets cemented to the teeth, these custom fitted rubber trays, or aligners, fit over the teeth. The trays put pressure on the teeth and gradually, with new trays every two weeks, your teeth will move into their proper position. Invisible braces must worn all day and all night, except when eating and brushing and flossing. The braces have finally come off and you’re ready for your retainer. A retainer retains your teeth’s newly straightened position, and if you do not wear your retainer regularly, you will notice your teeth starting to shift back to where they were, creating unwanted gaps. Your orthodontist will discuss if a fixed or a removable retainer is best for you. A fixed retainer takes a little more work to keep clean, but you can be sure your teeth won’t shift back since a thin wire is bonded with cement onto the backs of your front upper and lower teeth. Your teeth will remain in perfect formation with this permanent retainer. A removable retainer is a combination of acrylic material that has been shaped to your gums for maximum comfort, with wire hooks or clasps going across the front of the lower or upper teeth to hold the retainer in place. These retainers are removable, and should definitely not be wrapped in tissues or paper towels, as they’re most often mistaken for garbage and then thrown out. It can cost over $250 to replace these types of retainers, so be sure to stow them in the retainer case your orthodontist gives you. Orthodontists typically recommend wearing a removable retainer for 20 hours a day for three months, and then, after checking for movement, most often recommend only wearing the retainer at night.